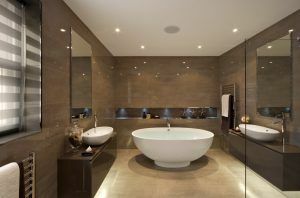 A bathroom design made in the modern style – that is what we see in the interior magazines most of the times. This is the style that most of us want to have in our bathrooms and mostly this is what we are looking for in the bathroom sanitary shops as we all know that it’s not just about the way it looks like (but even here we definitely have the association with the luxury life), but also about its functionality as this kind of bathroom furniture definitely looks into future. Of cause we should tell that the style of the bathroom design mostly depends on the bathroom furniture such as bathroom vanities and bathroom sanitary engineering such as bath and sink. 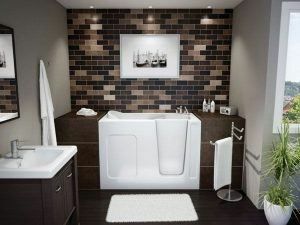 What is the main association we have in our head while talking about the modern bathroom ideas and about the modern in general? 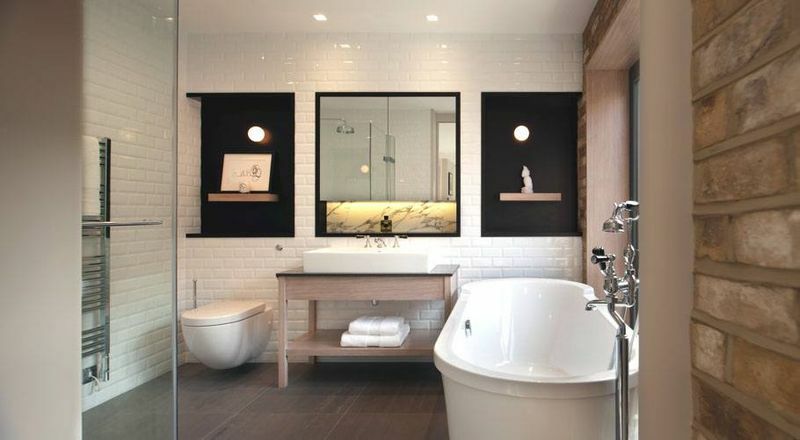 7 main characteristics of the bathroom made in a modern style. So first let’s find out what really makes this style be called in this way and what it’s main features are. The new technology’s and materials using. And that’s pretty obvious. The strict and straight lines. The really light color gamma. The minimal quantity of the decoration elements. Untraditional ways of the space zoning. The main materials are: glass, metal, plastic and stone. And now we gonna talk more detailed about each of the modern bathroom’s elements. And starting from the top we gonna say few words about the ceiling as this is the thing that gets really lots of attention on it’s establishing. Most of the times these are the white or at least the light color constructions. If the house planning is really huge than probably it will allow you to make a window in the ceiling which will make you not to need the fake light sources. 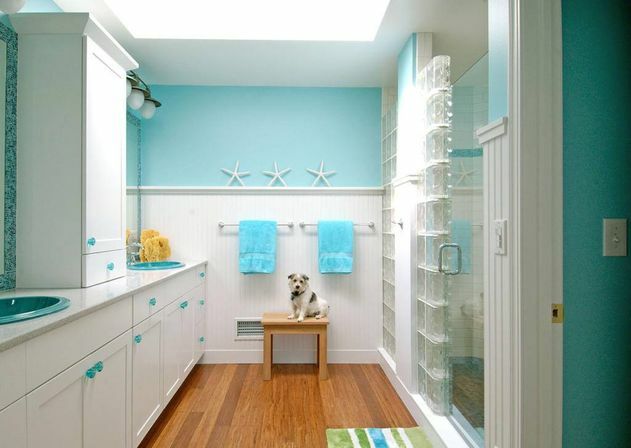 The split-level ceilings are really super functional and practical and by its help the bathroom area can be chosen by yourself. The lighting fixtures are usually de terminated by its soft lines and the really geometrical forms. For the floor material in the modern bathrooms most of the times the designers advice to use a ceramic tile being the most practical material for the places with the high level of moisture. Such a huge mass of the different choice in this material will help you to make the different design effects. As modernism is most of all is a rationality, the specialists advise to use a granite floor covering. 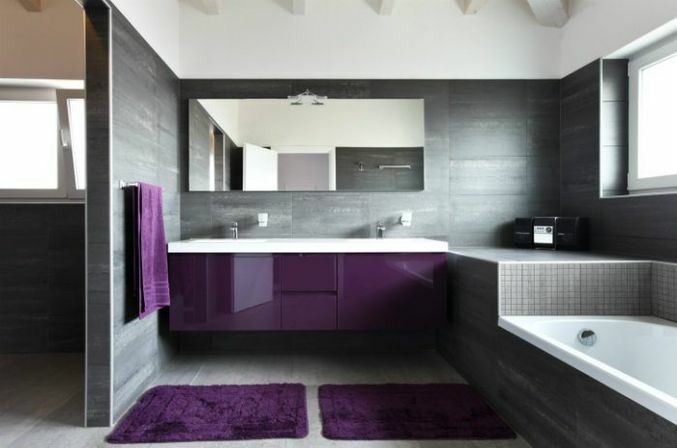 In the light bathroom interior it’s gonna look really interesting if you gonna place the darker or just the more colorful floor as it’s gonna accent the attention on the freshness and lightness of the main interior gamma. 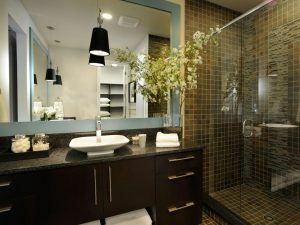 For example, the green mosaic tiles can be associated with the landscape outside of the window, and the black color can visually lift the bathroom space and make the weightlessness illusion. The main idea of modernism is the lightness and airiness of the space. And the designers are trying to reach this effect by using the white or the pastel colors. The walls made in light-green or grey gamma also look interesting. The tile here is the main material and it can be used having so many different forms. So it can be the classical one with the gloss surface or the one with the relief pattern. 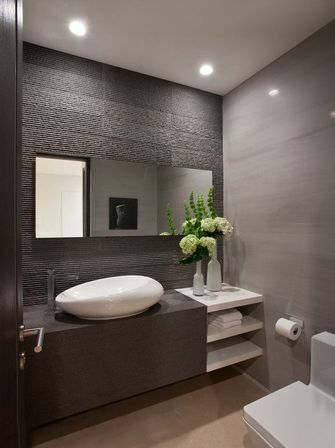 It looks really interesting if you use the tile imitating the real stone made from the small segments. 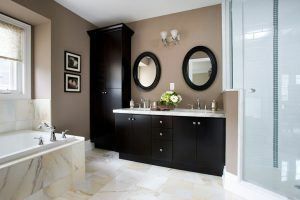 The smooth and plain wall surfaces is the most well-recognizable thing in the modern style that’s why this element should be definitely taken into your accounting while repairing the bathroom. 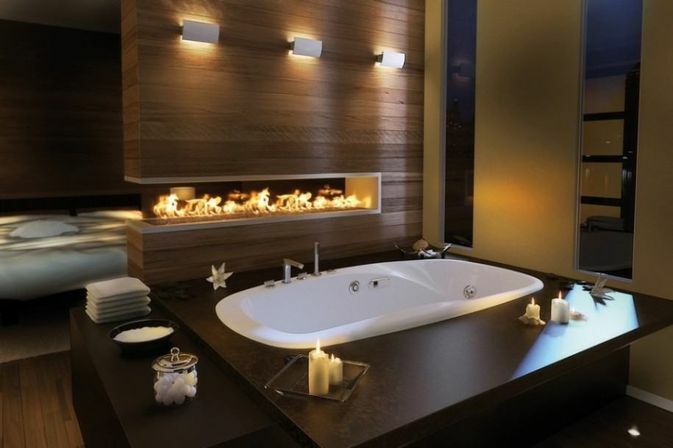 3 modern bathroom decor ideas. 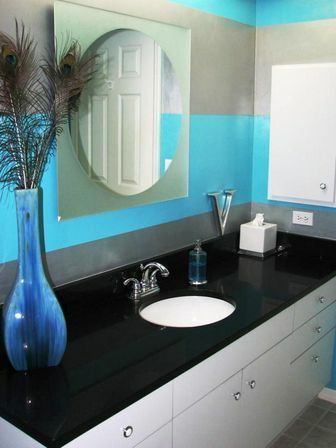 The sinks and the bathroom vanities. 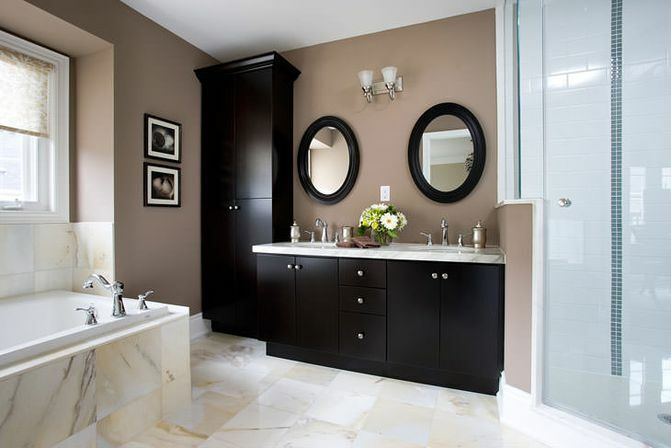 The double sink embed into the plain bathroom vanity top looks really simple and restrained. 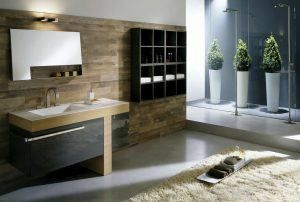 The bathroom vanities made like the rectangular pallet is the most well-known modern design form. Also instead of the traditional sink the designers let you choose such an extravagant variant as two slanted to the center rectangular segments that finally make a hole for the water going through. 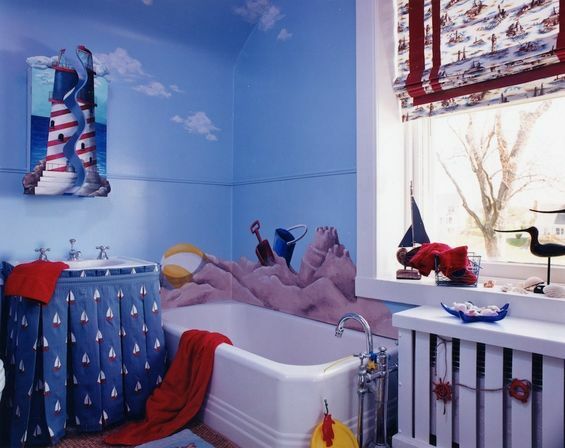 The bath decorated by the wood all around its perimeter looks really unusual. So if you also choose some other pieces made from wood than its gonna look like some kind of set. The bath that has a traditional oval form can be established in the middle of the room, but in this case you will need to think about all the communications to leave the maximum space around it. The windows in the modern bathrooms. 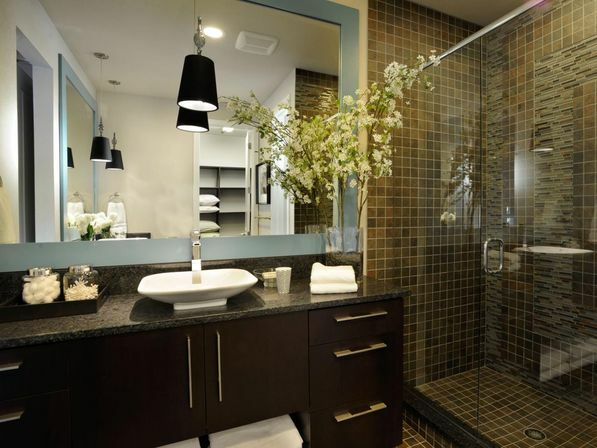 Such element as the window can be the main day light source in the bathroom or can even a special interior accent. The tiny window holes constructed just under the ceiling will let you to use the walls for the sanitary engineering establishing. The panoramic and the corner windows – are the most fashionable types nowadays. 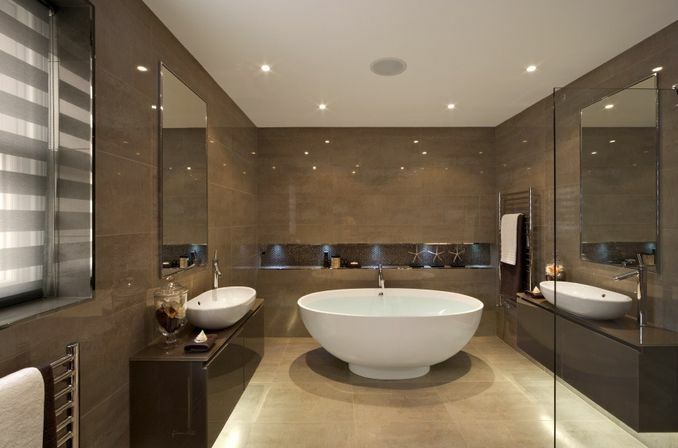 Of cause this type of glazing looks gorgeous, but won’t fit all the bathroom types. Moreover, you should be ready that the panoramic windows will usually sweat and there are will stay the water tracks.